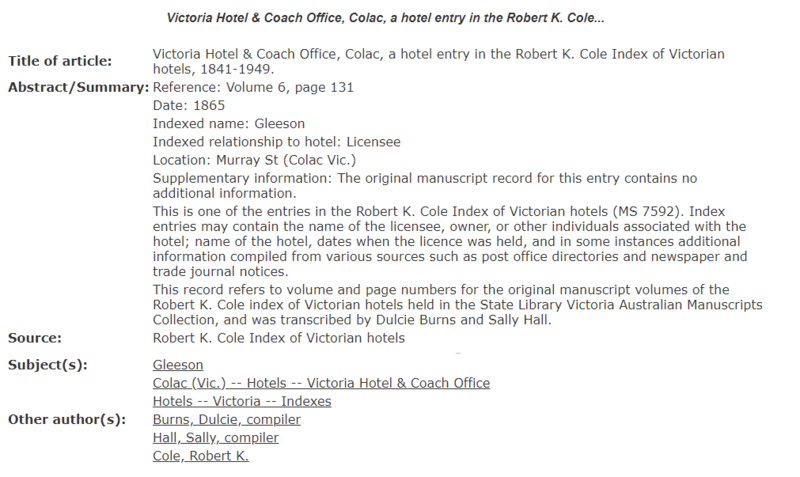 Great news for family historians with publican ancestors – the index to the Robert K Cole Victorian hotels collection (1841-1949) has been expanded, with a total of over 37,000 entries now searchable online! Start your online search here. Robert K. Cole. What’s brewing, June 1950, vol. 1, no. 2, page 4. The work of brewing enthusiast Robert K. Cole, the Cole Hotel Index (as it is commonly referred to) in the Library’s Australian Manuscripts Collection consists of information about hotels throughout Melbourne city, suburbs and country Victoria, gathered from various sources such as directories and newspaper notices. Each volume contains the name of the hotel and the licensee or owner together with the years of licences held by each licensee or owner. It’s a fantastic resource for family historians and those researching the history of pubs in Victoria, but Cole’s original handwritten workbooks were not always so easily searchable as they are today. Much work has been done by volunteers to make the collection more accessible to researchers, beginning with the publication of the Genealogy Volunteer Eric Tetlow’s Cole-Tetlow Index to the city and suburban hotels in 2000. This city and suburban index has been online and in the Family History Reading Room for many years. Now, thanks to the work of Manuscripts volunteers Dulcie Burns and Sally Hall, Victorian country hotels and their licensees are also infinitely easier to research, with over 16,000 new entries recently added to the Library’s keyword searchable Australiana Index. The Australiana Index entry for the Victoria Hotel, Colac. Each entry in the Index contains a volume and page reference to transcripts of the original volumes, located in the Newspapers and Family History Reading Rooms. You can find when hotels existed, who held licenses for which years, and entries tell you whether the originals contain additional snippets of information as well. So pull up a bar stool, search the Australiana Index, and see what you can find! Hint: A tip for searching the index for a hotel or publican in the Australiana Index – try searching the surname or hotel name followed by the phrase “index of Victorian hotels” (in quotes to search as an exact phrase). Kate is a Librarian in the Family History Team, State Library Victoria. 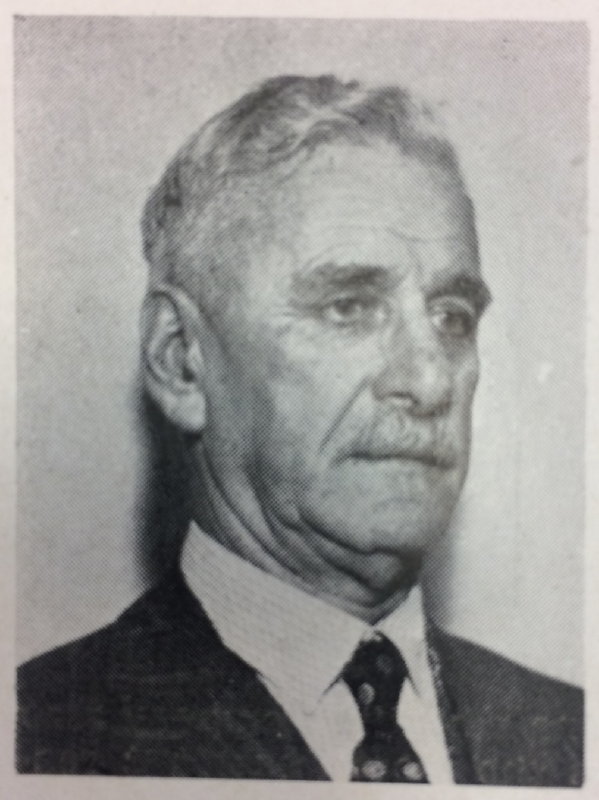 If you search the Australiana Index for ‘locarno horsham’ you’ll find a few entries showing your grandfather’s name! I tried to search the index this morning using the available on line link but the page says its not available …. Sorry to hear you had trouble accessing the Australiana Index – the links appear to be working today so I’m not sure what went wrong. Just in case, you can click here to access the Index, and you can always find it in the Search and Discover menu on our homepage. 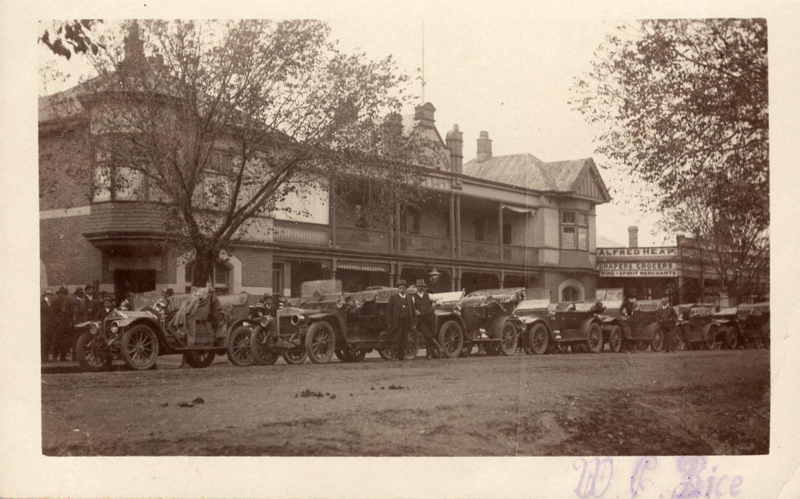 My great aunt Adela Dwyer was licensee of the Poowong Hotel, possibly in the 1930s or 40s. Any information about her would be appreciated. I suspect she and her husband were involved in at least one other hotel as well, perhaps earlier. Thank you for your question. I have transferred it to our online reference enquiry service and will be in touch shortly with hints for finding information about your great aunt. Stay tuned!